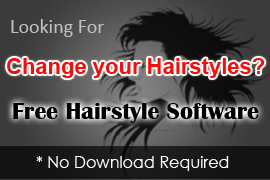 Note : Our FREE Hairstyle Software having below hairstyles of indian celebrities that you can try for makeover online. Note : Put here movie name or actor name here , e.g. Rang de Basanti,shahid kapoor etc..
Katrina Kaif used this particular Hairstyle in the movie MERE BROTHER KI DULHAN, that was a Romantic Comedy filem and debut of Ali Abbas Zafar. Hrithik Roshan innovate this Hairstyle During ad shooting of John Player that is one of the leading clothes company. Karina kapoor used this particular Hairstyle in the movie BODYGUARD of 2011, that was a romantic action film and breaks alot records in india and overseas. Shahid Kapoor used this particular Hairstyle in the movie 36 CHINA TOWN that was a murder mystery of a wealthy casino owner, Sonia Chang.This movie was a debut movie for Upen Patel and was released in 2006. John Abraham used this particular Hairstyle in the movie DHOOM that was a action movie and was based on fast and quite expensive robberies using faster motorcycles. Salman Khan used this particular Hairstyle in the movie BODYGUARD that was a action love story and break alot of records till now in 2011. Aishwarya Rai used this particular Hairstyle in the movie DHOOM2 , in which Aishwarya played a role of thief and hrithik won award of best actor for this movie. Ajay Devgan used this Hairstyle in the movie U ME AUR HUM that was debut film for ajay devgan and was released in 2008 and counted as one of the biggest flop of 2008. Emraan Hashmi used this Hairstyle in the movie ONCE UPON A TIME IN MUMBAI that was a crime drama film based on 1993 Mumbai Blasts. Sanjay Dutt used this particular Hairstyle in the movie DOUBLE DHAMAAL that was a sequel to 2007 comedy movie Dhamaal. Salman Khan created this particular Hairstyle in the movie DABANGG that was became the highest weekend grossing Bollywood film of all time. Karina kapoor used this Hairstyle in movie JAB WE MET of 2011, that was a romantic comedy film that explain the story of a feisty Punjabi lovely girl who is sent back track when she bumps into a depressed businessman on an overnight sleeper to Delhi. Hrithik Roshan used this particular Hairstyle in the movie ZINDAGI NA MILEGI DOBARRA of 2011, that shows adventure of three friends in Spain. Shahid Kapoor used this Hairstyle in the movie PAATHSHALA that was released in April 2010 .It's a Drama movie in which Shahid Kapoor played the role of a new English teacher in a school which has maintained high standards of excellence.